Purchased as part of the Pedal Minnesota (www.pedalmn.com) initiative, which strives to make Minnesota the “Bike Friendly State”, Minnesota state park bike trails are available at several state parks and trails. 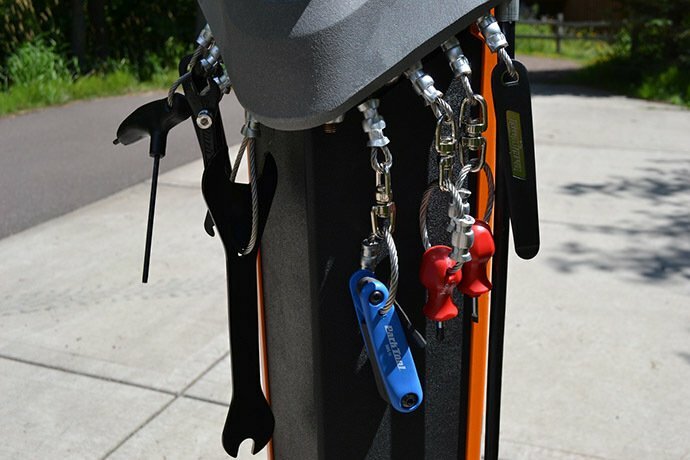 The stations are equipped with basic bike maintenance tools, including air pumps. Funding for most of the stations was made possible through a grant from the Federal Recreational Trails Program and matching state funds. One station was purchased by the Gateway-Brown’s Creek Trail Association and another by the Preston Community Foundation and the Preston Tourism Board. Root River/Harmony-Preston Valley state trails – eight stations. Paul Bunyan State Trail – five stations. Heartland State Trail – three stations. Gateway/Brown’s Creek state trails – three stations. Luce Line State Trail – one station. Willard Munger State Trail – three stations. Douglas State Trail – one station. Cuyuna Lakes State Trail/Cuyuna Country State Recreation Area – two stations. Fort Snelling State Park – one station. William O’Brien State Park – one station. Jay Cooke State Park – one station. Gooseberry Falls State Park – one station. Split Rock Lighthouse State Park – one station. For more information on biking in Minnesota’s state parks and on state trails, and to access a map with locations of the new tune-up stations, visit www.mndnr.gov/biking.